See that column of black smoke up in the sky? That means all those Cardinals still haven't picked a new Pope. That also means you still have a chance, if you're a male Catholic. It won't be easy — this year's race to the right hand of God is hotly contested, with some serious celebrity endorsements. Like Dennis Rodman, who is heading to the Vatican to campaign for Peter Turkson, who could possibly be the first black Pope. If the fact that Dennis Rodman, just back from palling around with Kim Jong Un, is planning on campaigning for a Pope isn't weird enough, this detail from the story is: he's using a "Makeshift Popemobile." 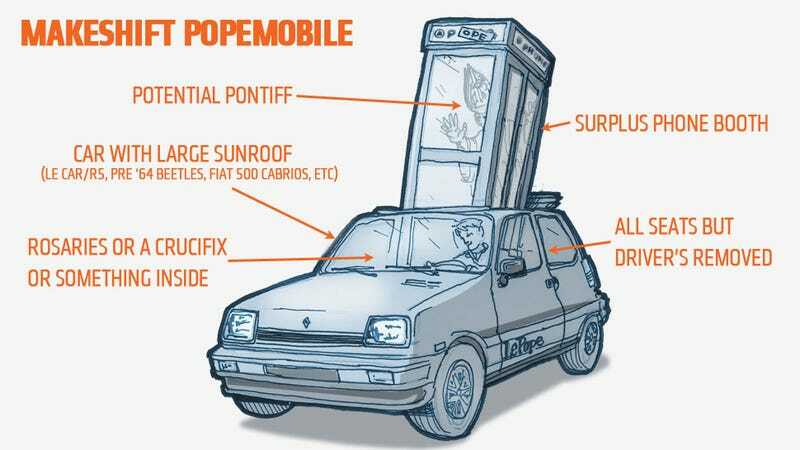 Are there any words in the English language more beautifully evocative than "makeshift Popemobile?" I doubt it. Now, we haven't heard details about Rodman's Popemobile, but for those of you without Dennis Rodman's considerable resources but who still want to be Pope or help someone be Pope, don't get your vestments in a twist, because I'm here to help. Today we're going to find the quickest and dirtiest path to Popemobilehood. The key here is quick. Those guys in red are already voting, and if you want to get you or your candidate seen as a viable contender, you'll need to get them looking totally papal in public as soon as you freaking can. So let's break this down. Luckily, there's only really two key parts to a Popemobile: the car part and the Pope Display Case part. Cars we can find, so let's focus first on the Display Case. We don't have the time or money to fabricate anything, but luckily there's a pretty close analogue you should be able to pick up cheaply now: a phone booth. You'll want one of the old-style enclosed glass phone booths. Cell phones have made these pretty obsolete in most cities, so hopefully you'll be able to source one in some surplus shop around Rome. I say Rome because this is where you'll need to show off your Papal chops — it's where all the voters will be. Some companies sell refurbished ones, but I'd check municipal scrapyards for real bargains. Just make sure it has most of the glass. Once you get that, now we need the car part. Your first instinct will probably be like mine, and that's to just get a pickup truck to stick the phone booth in. While this is the easiest solution, there's a number of issues. First, a tall, upright phone booth with a potential Pope inside just isn't that stable, cargo-wise. You'd have to lash it down quite well, which would make things look sloppy, and under acceleration, braking, and turns, that thing is going to wobble around. No matter how well you tie it down, there's going to be a decent amount of travel there, and that's going to beat the crap out of your Papal hopeful. Nobody wants to see the potential Holy Father's face getting slammed into the glass every time you get to an intersection. You want this man to be Pope, and for that he'll need to be relatively undamaged. Plus, roads around the Vatican are pretty small, European-scale roads, and many trucks are just too bulky to really weave in and out of these like you'll want to to make sure your Pope gets the exposure he needs. So, I think the best option here is to find a small car with a big sunroof. Luckily, in Europe there should be a pretty easy-to-find option: the Renault 5, also known as the Le Car here in the US. There's other options as well, like the new Fiat 500 Cabrio, but we'll use the R5 as our example in the interest of keeping it cheap. The 5's sunroof appears to be just barely big enough to cram in a 33" square-footprint phone booth. It'll probably rub and scrape where the sides touch, but that's actually better for our purposes. You'll want to remove all the seats but the driver's from the car first to fit it in properly. The trick here is you'll probably have to get your hopeful Popeful in the booth before cramming into the car, since the doors will likely be pinned closed once in the car. Alternately, you could cut a hatch in the phone booth's roof as well. Once you get that phone booth nice and jammed through the sunroof, the end result should be that the booth is very tightly wedged into the car, and has almost no room for unwanted motion. You may want to cram some jackets or towels in between where the booth touches metal to eliminate the no doubt constant squeaking and scraping. At this point, a quick spray of white paint to the car will really sell it. Rattle-can is fine, just try and keep the windows clear. Also, now is a good time to make sure you've cut enough air holes to keep your Pope breathing easily, and it's not a bad idea to make a hole to pass him water bottles and a hoagie or something. He's going to be in there a while, after all. You're ready. Get your Papal candidate all dressed in his best Vestments, cram him in, and get ready for a full day of zipping around Rome and Vatican City, honking the horn and using a bullhorn to promote your Pontiff. Be agressive! Remember, Dennis Rodman will be out there too, in his makeshift Popemobile, and he has lots more star power than you. But you've got hustle! Go get 'em!